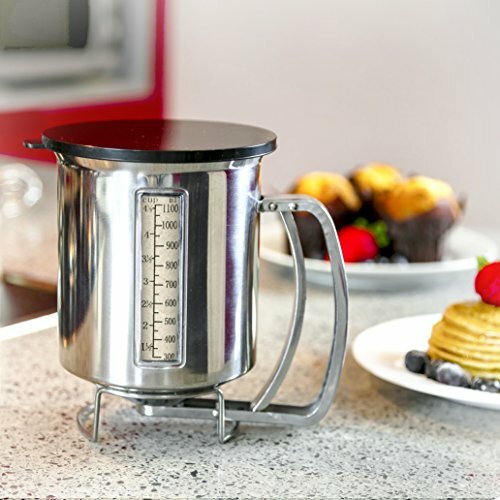 Newest Improved Pancake Batter Dispenser with Lid-Stainless Steel-Professional Kitchen Tool-Great for Baking,Cupcakes,Muffins-Cooking Crepes,Waffles-Latest Easyflow Spout and Measuring Gauge in Mls. 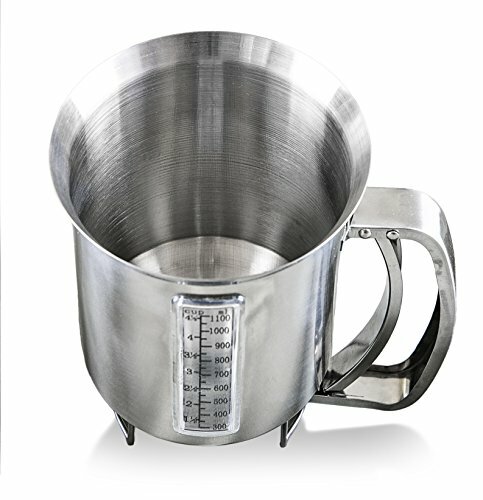 and CupsPORTION SIZE-With our easy to read measuring gauge in mls and cups, that problem of different size cakes, muffins, pancakes and any other baked items is no longer an issue. Just squeeze the handle, its as simple as that. SAVING TIME-With our added lid which seals around the dispenser allows you to store your mixes for when you are ready to cook and also allows you to store left overs. Be prepared for those busy moments when time is at its essence. 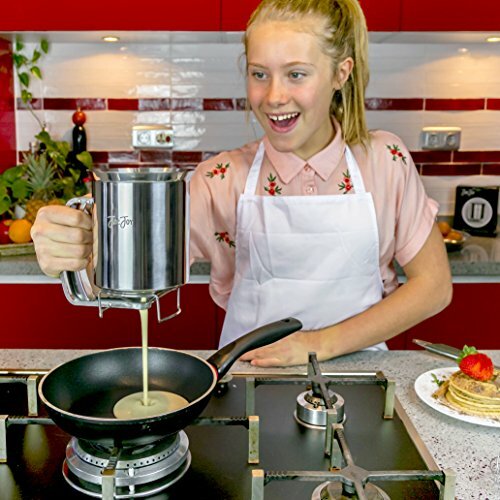 As a mum myself breakfast time can be hectic, not anymore with your JaeJoy pancake batter dispenser. 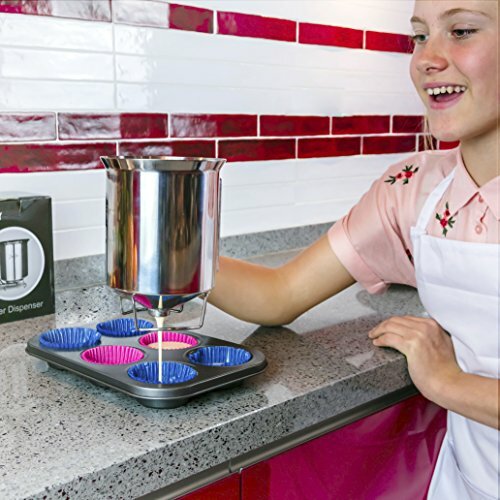 BONUS-Our redesigned bigger none drip valve allows you to make thicker mixes, also enables you to keep your hands and kitchen clean. This baking tool is child friendly, for those little kindergarten chefs in the house hold. 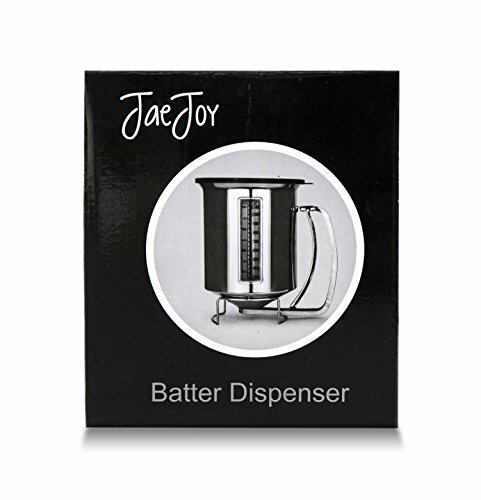 The dispenser is sturdy, cant crack and mess free. ideal gift for all ages and genders. 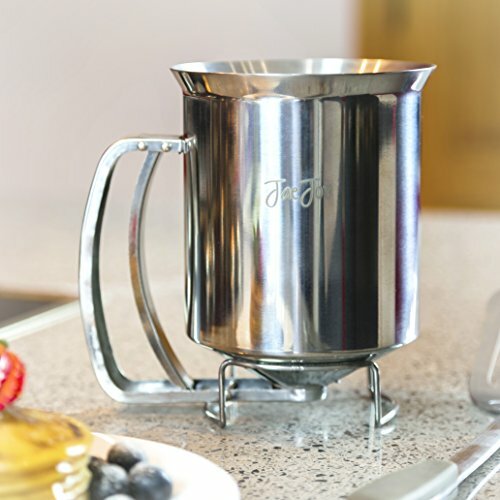 JaeJoy pancake batter dispenser will definitely end up being your best friend in the kitchen. 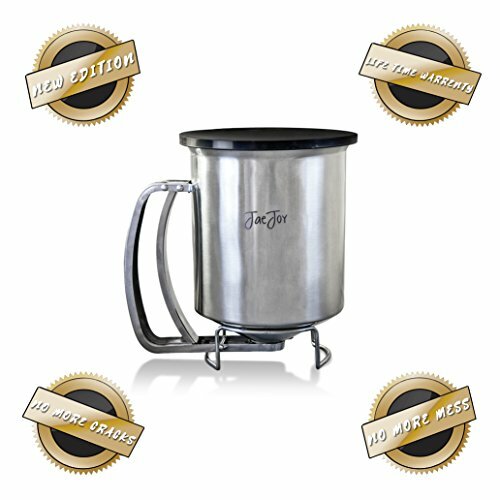 AMAZING NEWS-JaeJoy proudly presents to you a new improved stainless steel reliable pancake batter dispenser with a lid as an added feature. The perfect kitchen tool for everyone. 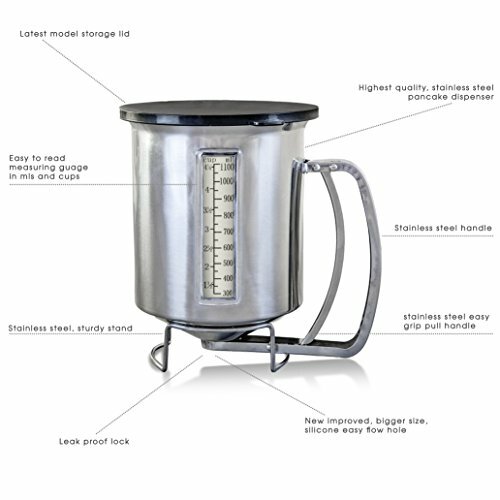 Our dispenser is made of 18/8 stainless steel, so you will receive the highest quality that you should expect. This useful gadget is easy to use and simple to fill due to its wide mouth opening and the quick close valve, equals no mess. The new improved valve, allows from your fluffy pancakes to chocolate chip muffins.